To celebrate the Beta 18 I decided to create challenge for anyone who wants to partake. Back in Alpha 16 I did something very similar, and it was both hilarious and fun, I encourage you all to join in. The challenge is, simply, to survive by any means possible. You'll start out with a single predetermined pawn, Cross, who's got great traits and stats. You'll get the same resources you'd receive in a 'The Rich Explorer' scenario, but no pet. One Settlement Only. This means never setting up another settlement, never moving either. Looking forward to hearing your stories of triumph and failure! Cross lived in his 4x4 base through the first winter without too many problems. during spring/summer, he focused on an extension for a new hydroponic basin, increasing the base to 9x4, but bad calculation: no more steel for a third heater, and no way to find some before the second winter knocked on the door. Result : the hydroponic rice grew a little bit slowly in the cold. Cross had no other option than to eat raiders when food became low, after a few "hiding in a room" breakouts, a "berzerk" breakout send him far away from the base, where he froze to death. hop hop, rewind and start again. No cannibalism, no human butchery? At least self-tend prevents a frostbitten pinky toe from being death now. Two tiers of construction jobs. One for expensive/quality items, and one for walls/floors/etc. Day 1: Everything goes off without a hitch. one fail-to-construct, but no damage done. Got a solar panel and a heater, because I can't remember if I can get away without a battery in the summer. Heater breaks down during naptime. OMINOUS. Day 2: got enough steel left to make a battery (Just in case), comms console, and orbital trade beacon. While building, hypothermia kicks up to minor aOMGAPOLARBEARISHUNTINGCROSS! He immediately takes to shooting and "wins "the fight, with a scratch scar on his right eye that reduces it to 10% efficacy. "Welp, better do what I can with this". I have him haul some glitterworld meds into the house buuuuuuut due to the fight, Serious Hypothermia was enough to floor him. Yeah. I couldn't get polar bears to stop spawning, either. I just had a go at this. Got too ambitious when I downed a Raider with really awesome stats. "I can handle two colonists!" I said. Hans Lemurson is hiding in his room playing computer games. Final straw was: Overdue projects. Trial number 2: Winter is beginning, hydroponics are set up, only problem: One wind mill is not enough to run sunlamp, and there is no steel for more. Bad luck :-) Ended freezing to death while eating a polar bear corpse stored in front of the house. Turns out combination of minor malnutrition, food poisoning, sensory mechanites and freezing is deadly. In the video you mentioned that no more wildlife would come, but I just saw a new polar bear arrive. I killed and ate the first one so this has to be a new one. Their minimum temperature is around -112F and the outdoor temp right now is only -82F. Sweet, sweet food! Attempt 1: Accidentally stayed outside too long and collapsed just short of the door. Froze to death. Attempt 2: Stayed outside too long again but just made it inside before collapsing. I can warm up and heal, huzzah! Heater breaks down. Freeze to death. Attempt 3: I kid you not attempt #2 happened again but this time it was the battery exploding and taking out a segment of power line. Attempt 4: Raiders managed to set my house of fire and too much burned down to rebuild. Froze to death trying to make a tiny hut and fire. At least the raiders died first. Attempt 5: Failed at constructing a Comms Console that was to be part of the wall for my first hut. Froze to death running to get new supplies. Attempt 6: Bulk goods trading ship came by right off the start, giving an influx of wood and steel. Two rabbits and the polar bear all came close enough to be hunted. With the extra meat and resources to be able to butcher and cook them, I foolishly rescued Skippy from an escape pod and he joined the colony. Skippy is a steadfast psychopath with a few good skills so I figured he could manage to resort to cannibalism when the food runs out. That last attempt is still going strong but I fear taking on a second colonist will be the death of me. Maybe the new polar bear will provide enough food for the time being. I got my food supply more or less stabilized, but opted not to add a new colonist (wanderer joins) to my base because I didn't have the materials for a new bed or any construction. I could have given her a sleeping spot, but that would have required moving my table! Besides, I wanted her armor vest. Queue the next raid, and all three pirates have wool Parkas. The Grenadier is comfortable down to -100C. Maybe I can survive this, maybe not, but I regret not having a Sociopath with level 8 in shooting on my side. Also, be careful with Psychopaths as a second colonist. Without access to the social skill they can imprison a colonist but they will never set one free. There is literally no way to set them free with a psychopath without dev mode. Even the dev mode "recruit" option doesn't work because technically they are already part of your faction. I got around it by spawning a new colonist and using them to release Skittles (which I had to try 3 times because it kept spawning more psychopaths lol). I didn't feel this was cheating because it seems like an oversight that a psychopath won't ever release a colonist, but that's certainly debatable. I'm not arguing that they might choose not to, but for the game to flat out not let them ever seems like overkill. Yeah, that was my thinking. A psychopath seems a little dangerous to live in close quarters with. In any case, the attack proved to be less dangerous than I feared. The grenadier bee-lined toward my base and ignored me shooting her, so went down quick. The next person opened fire with an LMG which is not very effective at max range against somebody in cover. When the 3rd, a club-wielder, went down the LMG user fled. A parting shot broke her arm and she dropped the gun. 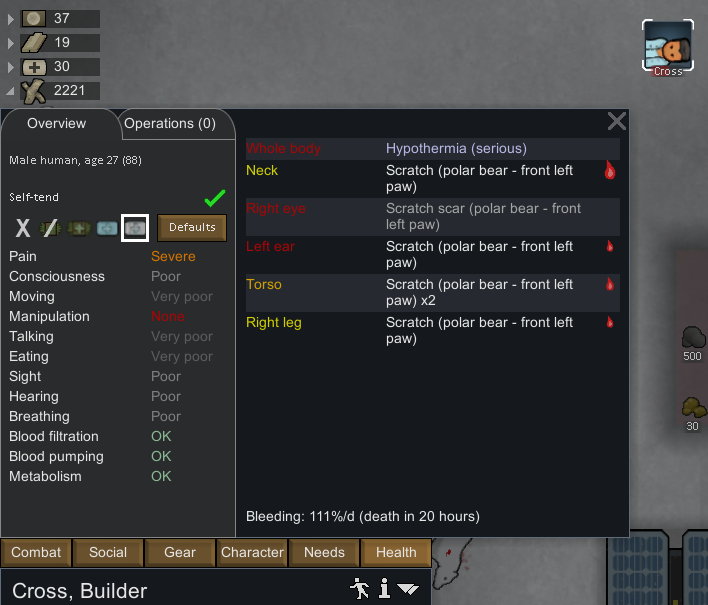 I now have a dead man's parka of Megasloth Wool that can keep me warm to -130C, and all it cost me was a small bullet to the leg (which healed up just fine). I can now scavenge steel from all over the map without fear of Hypothermia. Wool parkas are so snug, I almost don't even need heaters. Some cargo pods crashed into my wind farm with a loud bang. One turbine down to 33% health, and some mortar shells scattered around. This could have gone so very wrong so very fast. I'm dealing with a shattered femur and manipulation down to 50%. Keep trying to get a second pawn but I don't think I am going to get through that point. I will keep going until I get killed off. Mending, Fertile Fields, Smokeleaf Industries and the Giddy Up series. What happened to your guy's femur? Scyther shot to the leg? Sorry Radius, shattered Radius. Yes Scyther shot to the arm. Should have built my turret earlier but went with an extra hydroponics bay instead. I am hoping someone with decent medical will join and actually survive getting into the base or survive getting rescued. I have 4 scyther blades and a thrumbo horn (2 Thrumbo horns after I butcher the other one) for a replacement arm. Or do I just give up and start again? If you can get your hands on a bionic arm, then all you need is a new colonist. New Colonist Season doesn't begin until summer though. I tried to rush over to a crash-lander with a stack of wood to build a survival shack and campfire, but by the time I arrived, all I could do for him was strip the clothes off his body before they got dead-people stank all over them. But what can you do at -110C? I'm sure at a balmy -60C I could have saved him. You know life is harsh when Dry Ice (-80C) seems warm. I forgot to save up Steel for a turret of my own though, so I'm a bit worried now. How long can I continue to get lucky? So far I have been able to take down 6 Scythers with no injuries to Cross, but I my first partner colonist, Feeb, took a shot to the head and was saved only by her Synthread tuque (4/30 HP). She later died when a ZZzt set her on fire and I didn't have time to treat her wounds before another mechanoid raid arrived. That raid destroyed both my batteries and a windmill, leaving me powerless. Feeb was summoned from her bed to engage the Scythers as she could while Cross was pinned behind a pillar under heavy fire. She distracted a Scyther before it could destroy my Nutrient Paste Dispenser and open a hole into my base. She lost an arm and a leg in that fight, and I was going to euthanize her, but the loss of power did that for me. I only had set of clothing that could withstand the cold, and Cross was wearing it so she died on the floor of the frozen greenhouse. Eh, she wasn't that great anyways. Depressive Neurotics, amirite?